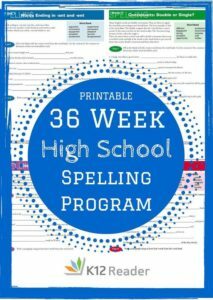 Below you’ll find our free, printable K12reader high school spelling words program that helps students master words that are most commonly misspelled. The program is designed for developing spelling proficiency for students in 9th grade, 10th grade, 11th grade and 12th grade. However, you may also find the program helpful for those in 8th grade. The K12reader High School Spelling program is based on comprehensive research conducted originally by Thomas Clark Pollock and printed in The English Record (English Record; v22 n1 p46-53 Fall 1971), with permission granted to K12reader by the New York State English Council. Click here to view more detail about the background research. Five major groups of errors were noted in the research: (1) misspelling of endings of words, (2) misspelling of vowels, (3) misspelling of homonyms or near homonyms, (4) misspelling of consonants and (5) misspelling of prefixes and combining forms. Here’s a handy spelling rules handout that students can use when they are studying. Week 3 Spelling Words –Consonants: Double or Single? Week 8 Spelling Words – Consonants: Single or Double?